The crew of a ship that was stranded in Argentia earlier this month has finally gone home, but there are still questions remaining about what will happened to the docked vessel. The crew of a ship that was stranded in Argentia earlier this month has finally gone home, but there are still some questions remaining about what will happen to the docked vessel. 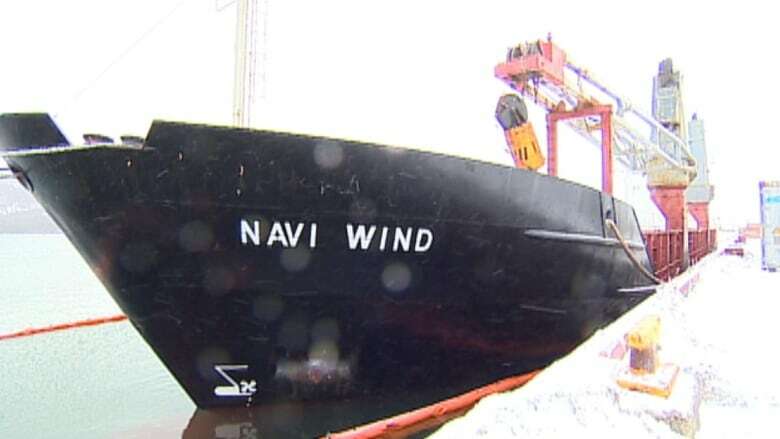 The Navi Wind cargo ship was headed for Turkey with a load of scrap metal when it ran into rough seas off Placentia Bay on Dec. 4. The vessel was forced to turn around, and has been docked in Argentia ever since along with its 11 crew members from Croatia, Greece, and Slovenia. "Earlier in the week, there [were] two other crew who returned home," Bradbury told CBC on Saturday. Bradbury said the entire crew have been paid their back wages totalling close to $100,000. The spokesperson said the one remaining crew member has made an arrangement with the owner, who's in Egypt, to stay with the Navi Wind. "The owner is trying to get Egyptian crew here right now, but this vessel is probably going to go no where in a hurry because there's 26 deficiencies against the vessel...some of them serious safety infractions," Bradbury said. The vessel is currently being detained by Transport Canada, and Bradbury said the Navi Wind could remain in Argentia for quite some time.